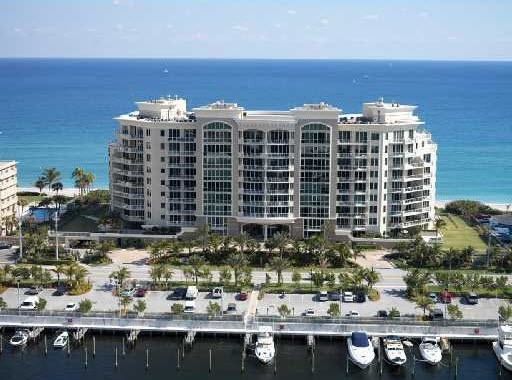 Coastal Flood Zone Revisions (CFZR) provided professional services to Ocean Grande Beach & Marina Condominium, located at 1063 Hillsboro Mile, Hillsboro Beach, Florida. CFZR was responsible for preparing, submitting, and support of an application to the Federal Emergency Management Agency (FEMA) for a Letter of Map Revision (LOMR). Services included collect/review available data, site visits, determine 100-year storm parameters/calculations, model one new transect using FEMA’s C.H.A.M.P. model, draw proposed flood zones of project area, perform revisions to model and proposed flood-zone map, provide written description of the proposed LOMR submittal, complete FEMA Form MT-2 for a request for a LOMR, and LOMR application submittal. CFZR prepared a current topographic survey that demonstrated existing elevations at the seaward face of the building were approximately 20 Feet NGVD. The existing grade is 10 or more feet higher than the Base Flood waters (the Base Flood Elevation on the FEMA Flood Map is Elevation 10 Feet NGVD and Elevation 9 Feet NGVD which included wave setup and runup. The key element in the successful LOMR was concluding that the coastal bluff that is seaward of the Ocean Grande Condominium had not been impacted by long term net erosion at this location between 1972 and 2010. Coastal Flood Zone Revisions (CFZR) provided professional services to Ocean Grande Beach & Marina Condominium, Hillsboro Beach, Florida. CFZR was responsible for preparing, submitting, and support of an application to the Federal Emergency Management Agency (FEMA) for a Letter of Map Revision (LOMR). Services included collect/review available data, site visits, determine 100-year storm parameters/calculations, model one new transect using FEMA’s C.H.A.M.P. model, draw proposed flood zones of project area, perform revisions to model and proposed flood-zone map, provide written description of the proposed LOMR submittal, complete FEMA Form MT-2 for a request for a LOMR, and LOMR application submittal. CFZR prepared a current topographic survey that demonstrated existing elevations at the seaward face of the building were approximately 20 Feet NGVD. The existing grade is 10 or more feet higher than the Base Flood waters (the Base Flood Elevation on the FEMA Flood Map is Elevation 10 Feet NGVD and Elevation 9 Feet NGVD), which included wave setup and runup. CFZR prepared current FEMA Elevation Certificates for the North and South Towers of the Condominium including additional elevations up to the first habitable floor. CFZR performed a detailed Location Survey of the seaward portion of each tower to confirm that each tower was clear of the V (high risk) flood zone designation. CFZR also located nearby street intersections to assist in the overlay of the flood zone map onto the Survey. Our efforts equated to an annual savings of approximately $30,000.00 in flood insurance premium. Coastal Flood Zone Revisions (CFZR) provided professional services to Jade Ocean Condominiums, Sunny Isles Beach, Florida. CFZR was responsible for managing the preparation of an application to the Federal Emergency Management Agency (FEMA) for a Letter of Map Revision (LOMR). Services included collect/review available data, site visits, determine 100-year storm parameters/calculations, model one new transect using FEMA’s C.H.A.M.P. model, draw proposed flood zones of project area, perform revisions to model and proposed flood-zone map, provide written description of the proposed LOMR submittal, complete FEMA Form MT-2 for a request for a LOMR, and LOMR application submittal. The objective was to attempt to gain approval from FEMA to remove the “V” Zone designation from beneath the structure. The "V" Zone designation was removed, and this process significantly reduced the flood insurance premium by more than $200,000.00. Coastal Flood Zone Revisions (CFZR) provided professional services to Sunset Marina Residences, Key West, Florida. CFZR managed the preparation of of an application to the Federal Emergency Management Agency (FEMA) for a Letter of Map Revision (LOMR). Services included collect/review available data, site visits, determine 100-year storm parameters/calculations, model one new transect using FEMA’s C.H.A.M.P. model, draw proposed flood zones of project area, perform revisions to model and proposed flood-zone map, provide written description of the proposed LOMR submittal, complete FEMA Form MT-2 for a request for a LOMR, and LOMR application submittal. The objective was to attempt to gain approval from FEMA to remove the “V” Zone designation from beneath the structure. The "V" Zone designation was removed, and this process significantly reduced the flood insurance premium by almost $100,000. Coastal Flood Zone Revisions (CFZR) provided professional services to The Ocean Four Condo Association, located on Sunny Isles Beach, Florida. CFZR was responsible for preparation, submittal, and support of an application to the Federal Emergency Management Agency (FEMA) for a Letter of Map Revision (LOMR). Services included collect/review available data, site visits, determine 100-year storm parameters/calculations, model one new transect using FEMA’s C.H.A.M.P. model, draw proposed flood zones of project area, perform revisions to model and proposed flood-zone map, provide written description of the proposed LOMR submittal, complete FEMA Form MT-2 for a request for a LOMR, and LOMR application submittal. Coastal Flood Zone Revisions (CFZR) provided Professional Survey and Mapping services to support an application to the Federal Emergency Management Agency (FEMA) for a Letter of Map Revision (LOMR) for the property known as Orchid Beach Condominium situated in Broward County, Florida. We confirmed that a portion of the structure located on the Property was located within a Special Flood Hazard Area along with a “V” Zone (high risk) designation. The objective was to attempt to gain approval from FEMA to remove the “V” Zone designation from beneath the structure. The "V" Zone designation was removed, and this process significantly reduced the flood insurance premium by nearly $100,000.00.